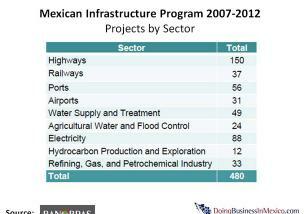 The Mexico Infrastructure Conference presented the Portfolio of Infrastructure Projects for 2010. The event was held last November in New York City. Multimillion dollar infrastructure public/private projects were presented and discussed during the conference. Under a global economic scenario were the financial markets are starting to experience certain level of liquidity, the Mexican Government decided to sail for large catch in the open sea. The US Dollar's recent decline has unlocked the gates to return the investments to emerging markets. Then, choosing New York as location for the Conference is no less than symbolic. The Conference program offered the opportunity of having one-on-one meetings with Government officials as well as with heads and executives of infrastructure development companies with projects and operations in Mexico. The most significant Mexican Ministers and Federal Agencies related to infrastructure SHCP, SCT, Pemex, CFE, Fonatur, Conagua, Banobras attended. The invited specialists came from infrastructure developers and construction companies, investment and commercial bankers, project finance specialists, law firms, financial analysts, and infrastructure sector service companies and consultants. 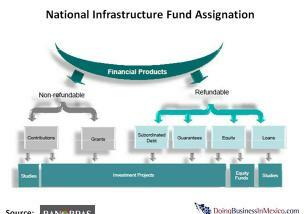 The high infrastructure needs in Mexico required a national policy that promotes the participation of global players. 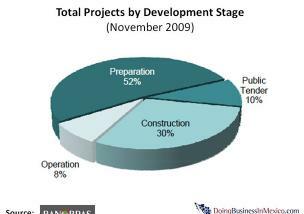 The investment in infrastructure projects stated in the National Infrastructure Program will be 226 billion dollars throughout 2007 and 2012. The projects belong to the electricity sector, highways, airports, water supply, refining, gas and petrochemical industry. See the figure aside. In order to improve the legal framework for public-private association, a new bill for Public-Private associations in infrastructure has been proposed to the Mexican Congress; this initiative is currently under discussion and is intended to be voted in the first semester of 2010. It is important to consider that the passing of this Law is not a requisite to start investment under this scheme. This is because there are several existent Mexican laws that indirectly recognize this type of investments. Even local States Congresses like the ones on the states of Jalisco and Nayarit have already passed their Private-Public Association bills. 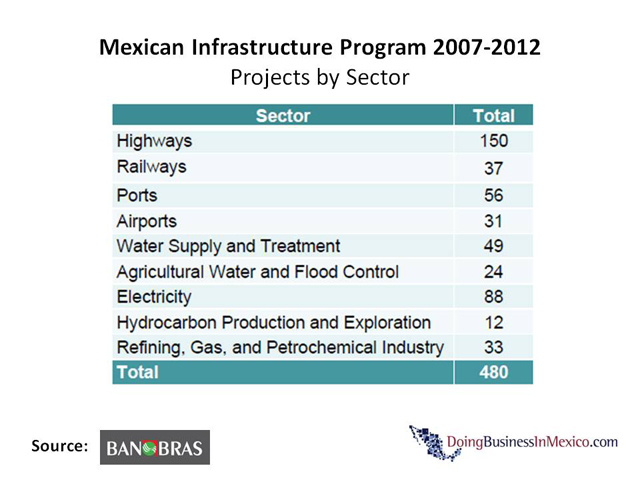 In addition to this, Mexican pension funds are expected to co-participate in the financing of infrastructure projects contributing with more than US $6 billion in 2010. 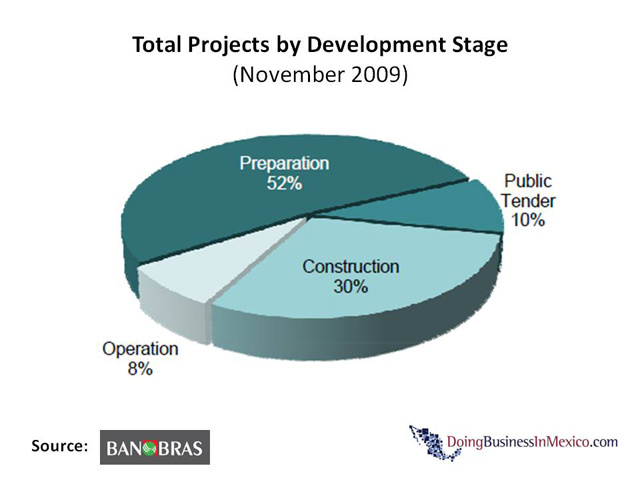 -Development Bank: Offering its clients a variety of financial alternatives that allow them to develop public infrastructure projects. 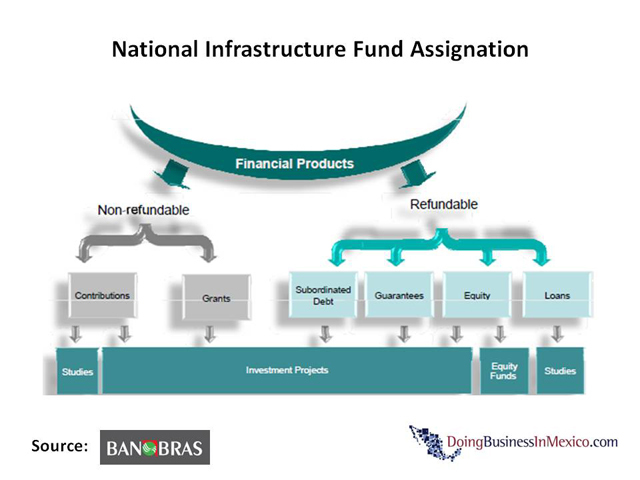 -Trustee of the National Infrastructure Fund: Promoting national and international private sector participation in the development of strategic projects. The aim is to make infrastructure projects bankable by supporting projects with high social returns, but insufficient financial returns; and by taking risks that the market is unwilling to take. See the figure aside. During the following weeks, a series of articles addressing the Projects technical and conceptual description will be posted in our Portal.